If you want to enjoy the photography and cinematography of Planet Earth II with optical physical media (not to mention stay under the ISP’s data cap), the 4K/UltraHD BluRay set of this documentary series is currently on sale for $30 with free shipping at Amazon by Amazon itself with up to five sets per customer at the sale price. For Prime members only, for a limited time, Amazon offering in UH / 4K digital video the six-part series Planet Earth II for $15. If you are not a Prime member, or not logged on to a Prime account, you will see the regular price of $29. A UHD television is required for UHD viewing, otherwise it will downgrade to HD or SD depending on screen and internet connection. If you have any “digital credits” they will be automatically applied if this purchase is eligible. If you enjoy nature photography and videography, the BluRay version of the Planet Earth II documentary is on sale for $17 at Amazon by Amazon itself, with up to two sets per customer at the sale price. Free 2-day shipping for Prime members or with a $25+ order. This is a 2-disc set. The 4K version goes for twice as much. And now, welcome to the Noisy Cinema Club 😉 Amazon has a variety of video options. 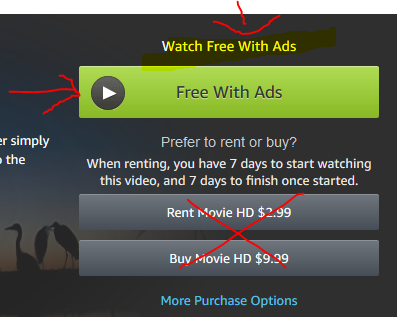 One of the lesser known options is to watch some movies for FREE but with ads. One of these options is the The Invisible Wildlife Photographer (2011) (51 minutes; Bence Mate). It averages 4.7 out of 5 based on 5 customer reviews. PS: make sure you click on the “Free With Ads” button, not the Rent or Buy buttons that have a price on them. If you love nature photography and videography, and want to put that 4K HDTV or Computer Display to work, the Planet Earth II (4K) [Blu-ray] is on sale for $35 at Amazon by Amazon itself. This is not a lightning deal, and you can buy as many as you want. The real Spock was also a photographer. It’s logical! A new documentary on the life of iconic Star Trek actor and photographer Leonard Nimoy has been produced by his son Adam Nimoy (111 mins, 2016) and it is now available for rental in HD (without ads) for $0.99 at Amazon Instant Video (or digital purchase for $5 in HD). This is part of a 99c Documentary Rental promotion. I haven’t seen this yet, so I don’t know if (or how much) it mentions his photography work.